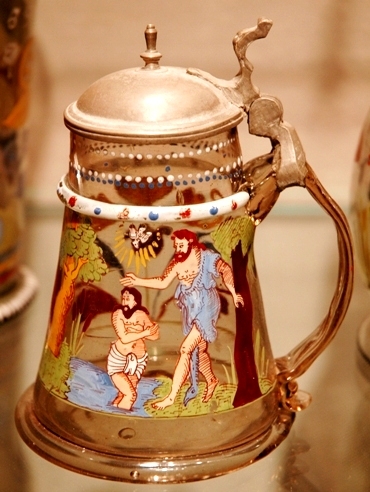 For some time, I had the first two of these steins listed on one of the pages of: “Not your average drinking vessel….” at the beginning of these web site pages. 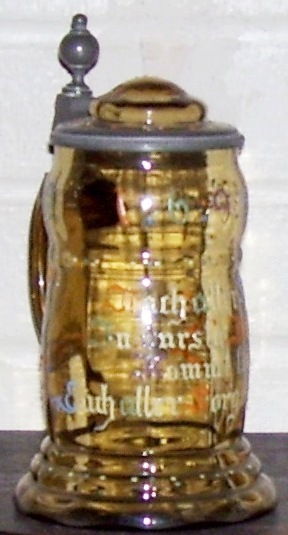 But as I acquired a couple of more photos and as most on those in the compendium were of single photos, I decided to make another new brief page depicting these hard to acquire glass steins. All of these were German made and are circa 1870-85. .5 liter. No date shown. 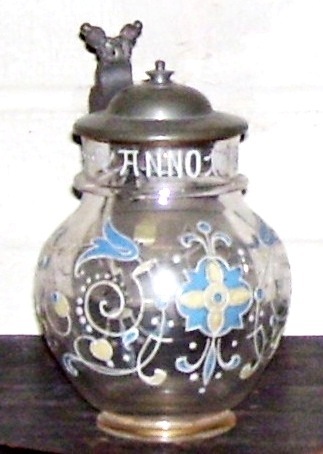 .5 liter blown glass, with enameled verse having alternating colored letters. This is not a Theresienthal piece. [FWTD] Dated 1695. A clearer photo coming soon= ? 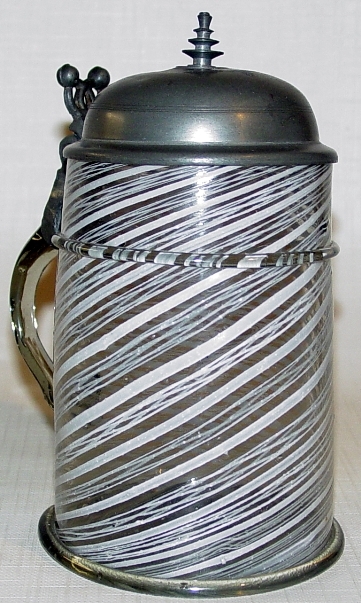 These steins might be rated a 5 (Uncommon) on the Smith – Paratore rarity scale. 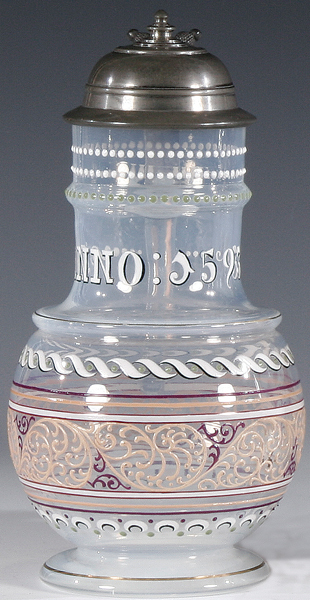 These above are called Renaissance “historismus” glass steins. Most all of these are dated in the late 1500’s to early 1600’s, but all were made in the 1870-early 90’s. But the new collector needs to be very careful out there. A collector friend of mine found an original one from the 1600’s in a local New England auction a few years back for less than $200.00! Photo of it is just below ▼. It has no date on it! But is Circa 1570=1620. 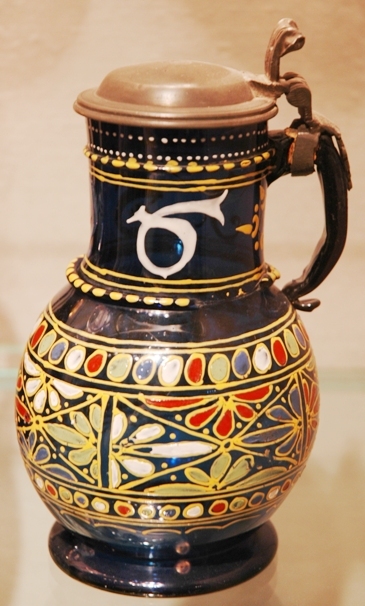 Here are a couple more photos of other real renaissance glass steins. 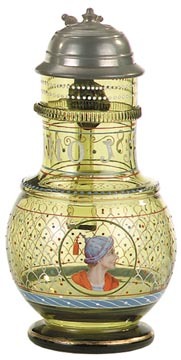 Both photos were taken at “Corning” = The Corning Museum of Glass, in, where else but: Corning, NY, the ‘Mecca’ of glass stein collectors.